I kept one of my big weight-loss resolutions this year – I ate healthy during our annual big game party. Not an easy task, but I did it this year with the help of some great healthy products out on the market now – including some great tasty treats from Cedars Foods. Cedars offers a variety of tasty good-for-you food that includes hummus, salsas, wraps, and my personal favorite, Tzatziki dip. The Tzatziki dip was a big hit at the party. 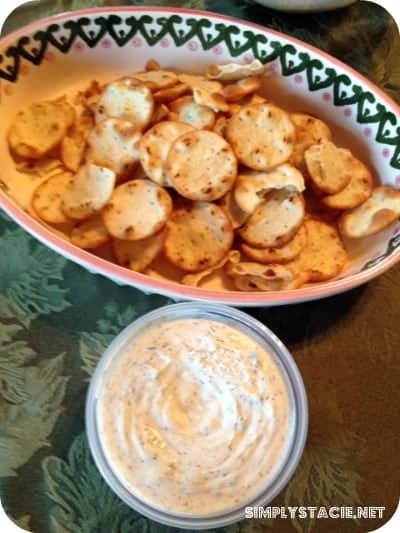 I served it along with sea salt pita chips, a perfect complement for the dip. I also enjoyed the Cedars tomato bruschetta, served along with mini toast crackers. The roasted red pepper hummus was perfect with our cold veggie tray. It was nice to be able to enjoy tasty snacks without the guilt! Cedars is a family run company that has a passion for providing consumers with the most authentic taste of the Mediterranean– including fresh Mediterranean salads, salsa, pita chips, feta spreads, Mediterranean sweets, spinach dips, and Tzatziki Greek strained yogurt dips. You can check out serving suggestions and great recipes right on the Cedars site. 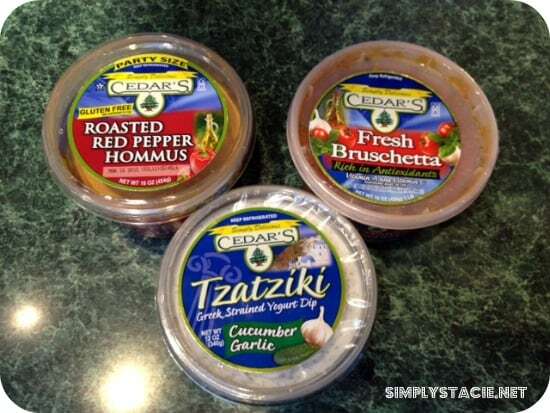 There are so many options for creating yummy, healthier foods with Cedars. Cedars products can be found at a variety of grocery stores throughout the US. You can also order from them directly at their online store. You can learn more about Cedars on their website, on Facebook and on Twitter. Would love to try the spinach dip! The authentic greek yogurt dip sounds really good! I also think the tzatziki sounds great! The Rich ‘n Creamy Spinach Dip would be my item of choice! Would love to try the feta spread and the spinach dip! I love the Roasted Red Pepper Hommus. I love their tzatziki garlic and cucumber, it’s awesome. I like the Pita Chips. They are great for snacking. Roasted Corn Salad sounds tasty. I love the Spicy Hot Tzatziki!